I totally meant to put this up before New Years, because….black eyed peas! But dang have I been busy. Or lazy? I forget which. Blazy? Oh well, it’s never too late for black eyed peas, right? I’ll tell you some of the upcoming projects I’ve been working on in an upcoming post, but for now let’s talk about this curry. 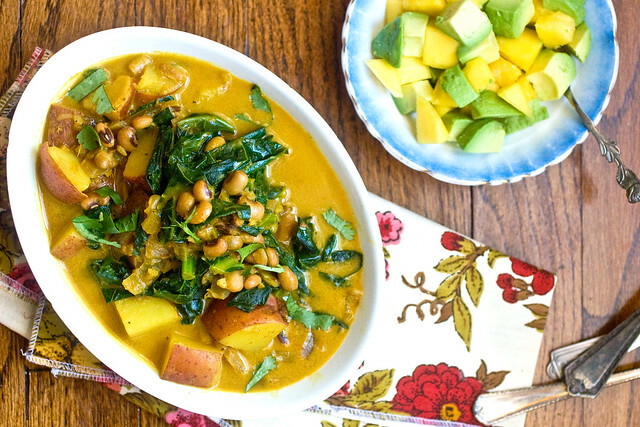 Chunky red potatoes, velvetty collards and earthy black-eyed peas make for a voluptuous coconut curry that is slightly out of the ordinary. It comes together real real fast, too. Serve with basmati rice and an easy mango and avocado salsa, for sweetness, tartness and a little extra creaminess. Have some sriracha at the ready in case you want a little extra spice! ~ This is a verrrry versatile and basic curry. You can swap the black eyed peas for chickpeas, or the greens for spinach or kale. You can even swap the red potatoes for sweet potatoes (although keep in mind sweet potatoes cook a lot faster.) But don’t swap the tomato paste for ketchup or the coconut milk for orange juice or anything gross like that. omg yesss I love you I cant wait to make this!! Holy smokes this looks amazing! I used to think that I didn’t like black eyed peas. I also used to think that I didn’t like baking… vegan food is definitely a game changer! I made the black-eyed pea and collard tacos from Isa Does It on New Year’s Day. They were amazing. And the leftover peas were delicious for days. I had Hottie Black Eyed Peas for New Years, so no worries. But this I’m making ASAP. I missed you! I understand the blazy thing, though, happens to the best of us! This is definitely going to happen ASAP! Beans, greens, potatoes, and coconut curry sauce? YES. This looks amazing, can’t wait to try! Thanks! Made this tonight and this is a keeper! Delicious! Yes please and thank you. Looks delicious. Btw, I LOVE your new book! January 19, 2014 at 4:25 am: Sara D.
Made this tonight. Very yummy! Thanks for the recipe. I subbed kale because the store didnt have collards. I would definitely make this again. Just made this. So. Freaking. Good. Thanks for another fabulous recipe! I made this with all of the suggested substitutions: chickpeas, sweet potato, and spinach & kale. It was delicious!!! I brought it to a potluck and everyone loved it! I made this for a client who is oil-free, and it came out DELICIOUS. I subbed sweet potatoes for the potatoes and added some freshly grated turmeric, and left out the coconut milk, because I was thinking it was done, tasted it, and decided it was delicious as is! Excellent recipe, Isa! Thank you! Made this tonight by subbing sweet potatoes and kale. Excellent!! Thank you, Isa, for another delicious dinner! I am made this tonight and found that my potatoes took way longer to cook, even though I think they are about the size of the ones in the picture. Just mentioning in case anyone else has that experience! This was a project, but worth it. Everybody loved it. I would definitely make this again. I didn’t add the agave or the salsa, because I like to minimize sweetness in my savory dishes and because finding and preparing the ingredients for the salsa just might have sent me around the bend. This was incredible stuff! The spice blend was perfect. I’ll be making this often, by popular demand. This is so good! I have made it several times and its always a crowd pleaser. Made this last night. Substituted kale for the collards and added a ton (well, maybe a cup) of chopped cilantro to the salsa. Served it over wild rice (’cause that’s what I had in the fridge). It was a super keeper! Thanks! Also sent the link to my son (who is decidedly non-vegan). He made it with sweet potatoes and kale and loved it. I just made this and wowza! It’s good! I replaced the red potato with rutabaga which adds to the flavor! And i’m glad reading your article. But should remark on some general things, The site style is wonderful, the articles is really nice : D.
Looks really nice! Had a similar recipe with plantain and sweet potato in before, it was great. I’ve visited many vegan websites, but have to admit I am totally blown away by this one. I am spreading the word to all my friends. Love Love Love! Made this tonight- it was DELICIOUS!!! Only I forgot to make the avocado salsa because I was so excited to eat the curry! Thanks Isa for another winning recipe. Wow, wow, wow, wow, wow! Did I mention “wow”? Do not wait until New Year’s to make this. It is spectacular. Thanks for this recipe! I’m a regular user and am know your recipes will always be a hit. Just made this one with kale, sweet potato, and leftover butternut squash. Big winner. Oh and I was excited to see your cookbook or one of them in a bookstore in Baltimore this weekend. I made baaaasically this curry yesterday, but swapped out the sweet potatoes for cubed kabocha squash, and the collards for swiss chard. Fast-cooking and delicious! This is a winner and I am so appreciative of how your recipes are using less and less fat and still managing to be flat out yummy. I served this to a crowd of all kinds of eaters ( adventurous kids, meat and potatoes woman, vegetarian and omnivores) and everyone raved. I doubled the recipe using only 1Tbsp coconut oil and only one cup coconut milk and it was still luscious and flavorful. You are my heroine. I made this and it was a hit! I really enjoyed it. The mango avocado salsa is great by itself! I tried to improvise a little with this recipe, using what I already have in the house. Chickpeas instead of black eye and kale instead of spinach. I also used water instead of stock. 1/4 tsp of salt as I try not to have to much salt in my diet and 1/2 of the agave, as i have also cut back on my sugar intake. It was great. I thought that when I made so many changes that it would make a big difference or taste bland and it did not. I will make this again. Thank you. Holy curry amazingness!!! I am eating this right now, and can’t stop myself. After a long run in the cold wind and rain, this is just the ticket to bring me back to life. Thank you!! I made this last night. Wonderful. I thought the salsa might be overkill, but it’s inspired. That bit of sweetness and creaminess–perfect! Thanks. I made this two days ago. I’m not an efficient mango slicer, so the mango has been gone since yesterday, and now there is only avocado salsa. Which is not the same as defeat. This is going on my short list of monthly rotations. Actually, this is the reason I now have a monthly rotation. This is wonderful and satisfying~ I used sweet potatoes, kale and garbanzos that I had on hand with lots of cilantro. Love it! Post Punk Kitchen | Vegan Baking & Vegan Cooking. I was actually moved enough to post a comment :-P I do have a few questions for you if it’s allright. Is it simply me or do a few of these comments come across like they are left by brain dead folks? Made the brit version – not sure what collards are so went with kale. It was yummy, really good. Thankyou :) And we had tomato salsa because we had some really good toms and no mangoes. This looks really good, but I have a question. Should I use canned coconut milk or the type that comes in the carton? Thanks! I used kale and green beans instead of collards and black eye peas and added pumpkin. It was great!! The mango and avocado really makes it. Thanks again Isa! I’m eating this right now and it’s phenomenal! Did mine with kale and sweet potatoes served on coconut basmati rice….MMM!! I lived my whole life snubbing sweet potatoes because I associated them with that yucky marshmallow slop served at the holidays. But, I LOVE curry and I saw your idea for curry with sweet potatoes and kale- so I said, what the heck, live a little and try something different. And, I did and the results: AMAZING! I did mix it up a bit by using my usual curry making M.O.- red paste and coconut milk- but, I would have never discovered my true love of sweet potatoes had it not been for you…thanks, Isa! We’ve now made this recipe three times in two weeks, but with chickpeas. It’s just gorgeous, and it’s easy enough to make that a person with a miserable cold can put it together. I’ve always been a big fan of collards, and now I’m obsessed with them. You leafy greens pusher, you. Just made this. Holy flavor! This is cheap, easy, healthy, satisfying, and delightful – definitely going into my regular rotation. Truly tastes restaurant-good – I had no idea I could make curries this delicious at home. The potatoes get super creamy and soak up the sauce, and I love the collards in it, too. It was also my first time ever trying black eyed peas. I had leftovers for dayyys. I can’t wait to make this for my boyfriend – he loves Asian flavors and I’m sure he will love this! Made this today and it’s great (I added an extra can of beans for more protein). Awesome! I used Yukon gold potatoes and chickpeas (what I had on hand) and hot curry powder instead of mild (but only 1t). And I skipped the salsa. My omnivore partner still gobbled it up and had seconds. This does come together really nicely and quickly. Perfect weeknight dinner! I reheated today after making it yesterday and it was even more delectable the second day than it was when I made it. And I still have some left for my partner – he’ll be excited! It’s going to be end of mine day, but before finish I am reading this fantastic paragraph to increase my experience. I have to say that this is one of my favorite recipes now!! I made it tonight and it was off the hook! My 11 year old son even ate it, which is about as miraculous as discovering penicillin, since he is anti-curry, anti-collards, anti-anything that is not a vegan burrito or Amy’s pizza… This is a keeper! My dad loves curry dishes, so I will have to make this for him next!! Thanks for sharing your creations! Loved this! Did not add the salsa but instead added a tablespoon of natural peanut butter to play off an African flavor. Totally delicious and easy to pull together. Thanks isa!!! My daughter and I made this recently for the family dinner and it was fantastic. The flavors mingled well and the avacado and mango salsa was the perfect touch. Thanks Isa for inventing such great and healthy recipes. I don’t think I’ve ever commented on any webpage before… O.M.G. THANK YOU. I know New Years has passed, but I’m totally making this tonight! Thanks for the recipe! Great recipe! I went with sweet potatoes and garbanzo beans and added about half a cup of peanut butter (hold the mango salsa!). Really delicious. Thank you! I just made this and it is delicious. The avocado and mango is a great idea although I used papaya instead.. beautiful! Your recipes have totally hooked me on collard greens. I can’t wait to try this preparation! This is really good. A coworker made it for a recent potluck, and almost everyone came back for 2nd/3rds. I think you’re the best cooker on the world! O love your recipes :) I’m waiting for more.